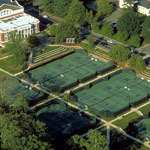 The Tennis Center is a recreational design/build effort for the University of Virginia encompassing demolition, redesign and construction of a tennis installation adjacent to UVA’s Gymnasium and the primary gateway to the University. Working with a world-renown tennis facility designer and a tennis court contractor nationally recognized as the expert on post-tensioned concrete, McKee Carson designed and built a premier tennis complex. The new Smith Aquatic and Fitness Center for the City of Charlottesville upgrades the former municipal aquatic center on the Buford School campus site to an innovative and modern facility that will serve the Charlottesville community for years to come. Working with BH+A and a host of other consultants, McKee Carson was responsible for overall site planning, landscape architecture, civil engineering, site plan approvals and in consulting on producing a facility that is LEED Platinum certified. Alongside E2 Environmental Consultants, McKee Carson was selected to develop the reuse design for Mary Alice Park, a former pesticide formulation and packaging facility which eventually became a Superfund Site under the U.S. Environmental Protection Agency (EPA). As part of the EPA's "Return to Use" initiative, the former Arlington Blending and Packaging site, located in the town of Arlington, Tenn., 23 miles northeast of Memphis, is one of only 12 nationwide selected as demonstration projects for the initiative.